The UNESCO will put this on the World heritagelist! Nominated for best comment ever!!! I think you deserve a parade and looking at the photo of all the tiny things, I think you have one… Congratulations! and you do realize that you will have to make one for your (future) grandchild??? With 3 daughters, I fully expect there will be more grandchildren to follow. Do you make one Advent calendar per child or per family? one per family i think , with an extra mouse knit for each new child to pop out as a surprise. Which day will your mouse come out ?! Flying mouse? At first I thought, flying pig. Check your supplies. Last time, as I recall, you squeaked by with the red floss. It’s fabulous, and the whole of the Blog is applauding. A virtual parade. I also thought pig at first — it’s because I don’t see whiskers, which mice have. The little pink nose looks sort of snoutish. AND, where’s the long tail? Mice have one and pigs don’t. I am in awe of you once again. I know your little wee ones know you love them and every year they will have a reminder. Merry Christmas to you and yours. I love that you are looking to this project’s future and the connection it will always bring the recipient! Very cool. Can’t wait to see it and the recipient’s response. If the child takes care with the wee ornaments and advent tree, his/her own child will also be able to enjoy and wonder at its beauty and be thankful for the patience and love that you put into crafting it! Yup. IMHO, it’s why knitters do anything. Ever. We think about the long-term effects. And this is why I don’t make socks for my youngest son. We both know they will end up in the washer and then, after that, maybe they will be big enough to fit the cat. Because cats love socks so very, very much. It’s the sort of thing they’ll tell guests about as it hangs in their kitchen when they’re grown. Turkey a masterpiece. I want to make one but I’ve used up my leftover little yarn by making a blanket out of the scraps. If it’s any consolation, that fairy mouse makes my heart crinkle. Working on the Gansey will be a breeze after this. Promise. Presbytera you are so funny ! I read this whole blog from the start just to make sure i didnt miss the post about spinning more endless grey wool and knitting the hmmm, think it was the underarm separation next ? I was really attached to that gansey process living vicariously through it. and i think i fell in love with this blog, Stephanie , the bike rally and the commenters . It has been awesome and inspired me to join the local knitting charity team. Thanks Pres, Stephanie & family , & all the readers – happy holidays to everyone. Thank you. Lilly, and the same good wishes back to you. Gansey? I thought that was done ages ago…. Oh my goodness, I forgot about the gansey!!! I’m placing bets that thing never sees the light of day again. Any takers? That wee Angel Mouse is so dear. Totally worth whatever words it took to get her completed. Ah…yes…what we lunatics will do for those we love. I just finished a toque — cutting off several rows so it **won’t** be “slouchy — in a dark brown splitty yarn with lots of cables…Sigh. Hugs to you, Steph! Congrats on finishing all the wee things. Amazingly, you still have time to get the rest of it together without pulling an all-nighter! Your wee things are truly adorable. But really, the “when pigs fly” one wraps the project up perfectly! Fantastic! Little things all finished. Angel Mousie is adorable. Good going. All the little things are adorable, and will be loved by the little one who gets to pull one out every day of December. Congratulations on your perseverance and determination, and on your talent. I cannot tell you how proud I am to have shaken the hand of the maker of so many bitty, precious things for bitty, precious people. My son is 18 and if I start now I might have something similar finished before he makes me a grandma – hopefully in many years. And the fairy mousie is wonderful! I love the angel mouse. What a lucky kid. I’m loving all the little things! Please be sure to show us the completed tree, as well. Your “little” success is encouraging me to slog through multiple pairs of fingerless mitts, plus a few simple watchcaps/beanies/touques — boring knitting by any name, but so needed when Canada sends its love to Indiana each winter in the form of cold, cold winds. That was the last thing I knitted for my granddaughter’s advent calendar 2 or 3 years ago. I was stressed by that time too but I loved it when it was finished. I love your take on it. Well done yarn harlot !!!!! I wish I had an “Auntie Steph”. This is wonderous. The mouse fairy? There was a parade but amongst the Littles. If your wee knitting needles go walkabout, they have been bronzed and hold a place of honor in the Little’s town square. Although they seem to be ‘wee things’, they hold Great Love. 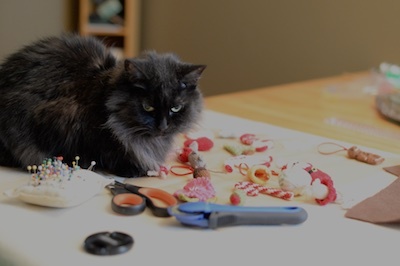 Well done for resisting the glue gun – that can end badly in the long run. Yes, your recipient will know when they are grown how much you loved them. Aaaaaww! 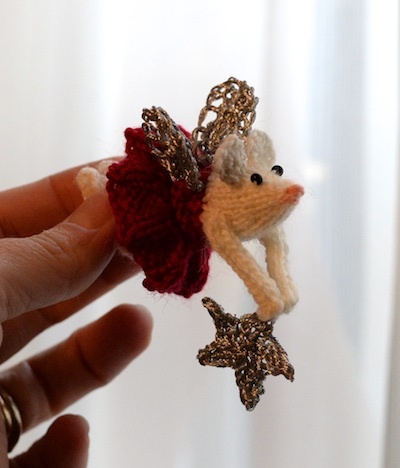 Fairy/Angel Mousie more than makes up for the 5-pointed snowflake. Utterly adorable, the whole thing! I love your mouse with wire wings & star. The child in me would absolutely adore it. And I am sure the future adult will as you say totally remember this with love. Well done! My betting is that you’ve actually knit 27 wee things and the cat has squirrelled a couple of them away!! I might die of cuteness over that mouse. I am so glad it’s not capable of toxic plagues, lol! That wee mousie is pretty darned cute. Well, you get it. That is truly an accomplishment. Love the fairy mouse . It looks like your cats likes to help like mine do , one of mine is currently obsessed with the pin cushion which is a bit problematic . Please, oh please, hide that pin cushion! Not to put a damper on the Tiny Thing Parade, but…. Oh good lord I almost died of cuteness (I collected mice when I was young) I clicked on your link and…. of course it’s Alan Dart I swear that guy is a genius at knitting stuffies. How he manages to insert personality into them is just brilliant. I can only imagine how much fiddily business went into making that mouse but it’s well worth it. I also noted a rare sighting of “the cat” always good to see him/her. Does “cat” have a name? Look at the January 19, 2008 post in the archive. It’s one of the things I turn to when I’m feeling down! I love your advent calendars so so much. I would love one now, as an adult – the kid who’s going to receive this one is going to be crazy in love with it! You are so close, keep on trucking. Wow, can’t wait to see the WHOLE finished tree! When working on something that results in bad words, I generally have the project sprinkled with holy water. Chases the potential bad karma totally away. The Advent calendar is fantastic, and the little person will absolutely adore it. Nice job! I swear, I looked at that last item and thought “Oh, cute, a flying pig!” about 5 times. Then I finally clicked through to the pattern….that’s not a pig! (But it could be with pointy pink ears instead of round grey ones.) I might have a fairy pig ornament or two in my future. I aspire to be the family lunatic. Keep on! I steeked yesterday, and started my own Christmas spreadsheet today (for the first time – I feel like there’s more to keep track of than usual this year). Oh my goodness gracious, what adorable lil’ knits! You deserve champagne and caviar for your work. WOW! I want and Aunt Steph!!!!! In the poem “The night before Christmas” I’m sure they refer to “MICE” as in plural mouse(s) so of course their should be more than one. 🙂 I knit small socks one year to to put on a string to be an Advent Garland for my son and daughter-in-law. They have to ‘refill’ it each year with what ever they want. The 24th was a red sock with white angora for the cuff. And I will confess I was able to buy a few hand-knit doll socks in a German market so I did probably 21 socks. Fabulous, Steph. Adorable times a hundred, and what a work ethic. I made a couple of your ornaments as gifts in ‘make, bake or re-gift’ type Kris Kringles. Thanks for the inspiration. Lunatic or not – I think you are wonderful! Such dedication through adversity while knitting all those tiny things! Reading your blog always make me smile, and more often than not, laugh out loud, thank you so much for enriching my life. Well Done! On to other adorable, knitterly things I am sure. The advent calendar tiny things are really sweet… with one exception. Last time you had posted the little mouse, I had just caught two mice in my kitchen. After reading your post on mice, and even thinking that this second mouse was pretty cute, I found two more mice in the traps this morning. No mice were caught in the interim between the two posts. I know that correlation is not causation… but please, I am casting my vote for only one mouse per advent calendar. Love that fairy mouse! What a sweet person you are, making all of these special knitted items. I cannot believe you knit the wings and star OUT OF METAL. (It’s gorgeous.) What an awesome gift. Thanks for the photos of the whole project! I think that for Christmas you should also buy this child it’s own safety deposit box in which this incredible treasure should live eleven months of the year. Honestly, can you imagine how tragic it would be were it to succumb to moths? or (heaven forbid) fire? or a flood? I have no investment whatsoever in this amazing piece of Yuletide artistry but even I feel that it deserves to be enshrined somewhere safe when not in use. I wish my loved ones would call me “a lunatic” instead of “a crazy perfectionist knitter”! I am sure everyone here on this blog is firmly in the lunatic camp right with you 🙂 (if it is any consolation). Wow…that little flying princess fairy mouse is quite lucky you kept at it until she came into being….squeaked through to mouse-ness. What a woman – what a knitter!! Yes, I see a flow of magic parade swirling over your knit-table. Amazing. Such a labour of love. And I need a fairy mouse for my Christmas tree. Here I thought I was a cool grandma for producing bulky barber pole (pink and purple) yarn for my granddaughter to knit mittens out of inside of 24 hours (beginning on Thanksgiving Day, no less). This is way more ambitious than that! Say, I have a question. Do you know of a book that gives good information about spinning wool to make socks? I’ve been knitting socks out of commercial yarn for years, but I’ve got all this carded wool…. Congratulations and lovely, lovely mouse. The tiny snowflake is perfection! Thank you for your words about knitting for the adult the child will become. What a lovely thought. Such an interesting thought. Maybe they don’t carry the frustration and negative feelings, but doesn’t it somehow seem like the knitted things carry the love. And what about prayer shawls? They can carry comfort and peace. That’s the ticket! Epic fairy mouse with tutu. You don’t see that everyday. ‘Expect you’ll be making another one next year. Fun to watch the evolution. Thanks. I am 59 years old with 3 grown children (the oldest is 33). My aunt made them a Christmas decoration/calendar of sorts that has a little bear looking for Christmas all through the house until he finds it on the 24th in the living room with his family. It has hung up in our home for over 30 years and every year we have discussions on whose turn it is to move the little bear. It makes me smile and miss my Aunt Joan more than ever….. But you do even the most beautiful things even when you are frustrated! Lovely mouse! So beautiful & so true. You are creating a beautiful piece of art & wonderful memories that will probably last for many generations. Loved the last line of your post. First I gathered up the mess left for me and sorted it into urgent, can wait and trash this piles. Dealt with the 3 urgent issues. And logged on to read your blog. My priorities are right on! Great job Aunt Stephanie. You rock! Working on my little things please post a link to your little Santa I can’t find one, thank you so much in advance! I had to click on the balloons so let the parade begin! I’m glad to see I wasn’t the only one who thought the angel mouse was a pig. Very cute either way. I love the lunatic that is you! Congratulations – let the parades begin! Use the zig-zag stitch set really close together to sew the numbers on. Trace the outline of each number on the felt, then sew over it. You can even get fancy & use a sparkly thread if you want to. Just get some tear-away stabilizer to use as a backing & off you go. Sending loads of virtual confetti so you don’t have to vacuum it up. You’re the boss, Steph. 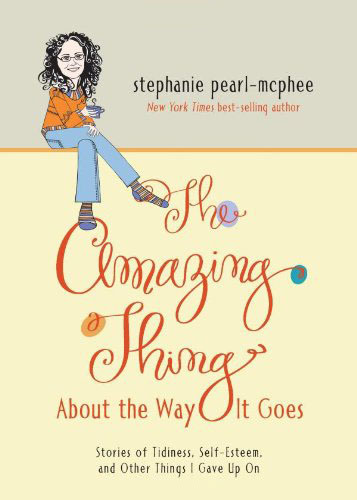 I know how frustrating it can be, but your work is just stunning, Steph! Amazing from start to finish! And I am sure it will be a treasured heirloom. Case in point — my mother slaved away for ages to make me a hand-embroidered Danish advent calendar, all in minute cross-stitch (you tie a sweet on each day’s ring) which I still love and cherish even though I later returned to my family’s Jewish roots and now have no use for an Advent calendar at all … but I still love mine, even if I don’t use it! Wow, wow, wow. I am speechless. I was feeling. 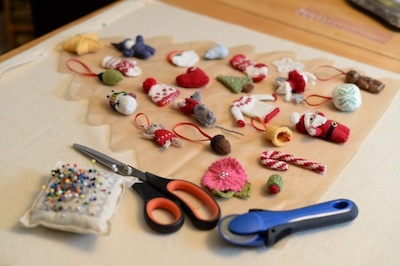 Very virtuous for being almost done with my 8 ornaments for grandchildren. And then I read your blog. You are amazing! Love the newest mouse. Adorable over load. The world could use more of your kind of lunatic. “I feel like there should be a parade” . . . I just marched around my office and down the hall as a little one-woman parade for you because I agree – you deserve one! That is such an amazing gift and will definitely be an heirloom for each recipient. LOOK at all those! I am in awe–well done! Wow, Steph, you ARE a lunatic… But a well loved one at that. So sweet. That mouse and its advent friends are an inspiration. Steph, despite the snarling at the end, they are lovely. on a totally different note, I’m wondering how Erin is doing. I know ya’ll are private as you should be, but I want you and her to know that I’m still keeping her in my thoughts and sending love and light and strength to her and your whole family. Hugs. I would pay to have a list of the ornments and the patterns you used. Please put it together and let us all know. Perhaps it could be a fundraiser for Doctors Without Borders or the AIDS charity. Just go back and check her posts. She has enough to do, doing it once. Hey, Steph, maybe I missed it but I don’t recall any mention of the “Christmas Spreadsheet!” Is it up and running? The world would be a better place if each of us had a lunatic who always really loved us. This is about the sweetest thing ever. One never knows what the kids will remember from their childhood. This is such a sweet and touching gift to give. Oh, please, must know what the black/white/gray/red yarn you’re knitting on the streetcar is!!! Favorite colors of both my husband and my daughter. This is just wonderful and so darling. You know it will be worth it, no matter the struggles. That Alan Dart pattern is truly one of my faves. I knit a bunch of them one year for gift toppers because they were so cute. I am including it in my upcoming Advent calendar for my grandsons and granddaughter. Hopefully, I can get caught up on the Advent calendar business.